Sit back and relax with this casual style upholstered swivel glider chair. Place the chair in your living room or den for extra seating space. Cozy up with a good book, or watch your favorite television show in this plush chair. The swivel base allows for easy side to side movement while the gentle gliding motion can be nice and relaxing. The rolled arms, skirted base and welt trim give the chair a classic and casual look. The Nantucket Swivel Glider with Slipcover by Rowe at AHFA in the area. Product availability may vary. Contact us for the most current availability on this product. Seat Back Loose pillow back cushion. 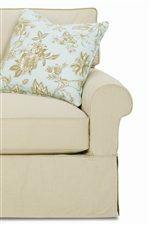 The Nantucket collection is a great option if you are looking for Transitional furniture in the area. Browse other items in the Nantucket collection from AHFA in the area.